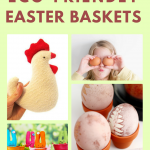 Do you want Easter basket ideas for kids that won’t add more plastic to the landfill? We’ve got over 50 ideas for zero-waste, creative and practical gifts. Includes homemade, budget-friendly, and organic items. This is an Easter basket you can feel good about giving to your children I know the feeling. You’re trying to cut down on plastic, but you really want to create a fabulous Easter basket for your kids. You look at what’s available in the stores but can’t quite bring yourself to buy more cheap plastic novelty toys and Easter candy with a ton of packaging. 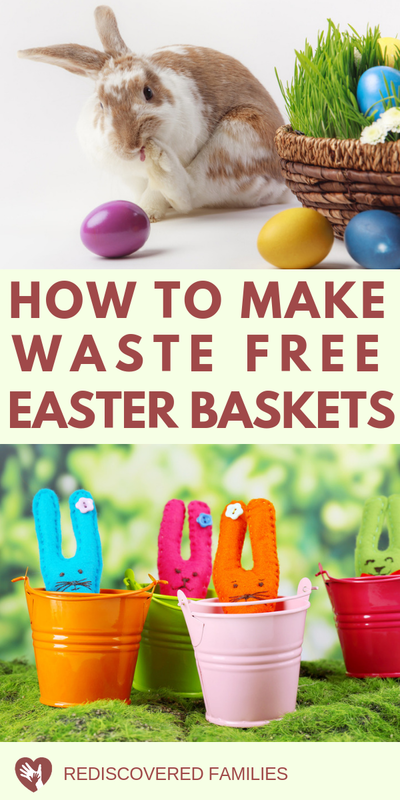 Wouldn’t it be great to create an awesome Easter basket with NO waste!? I know the stores are filled Easter stuff that is anything but waste free. So, you may wonder if it is possible to find sustainable gifts that you kids will love? You bet it is! I did it for years and I have some excellent tips to help you do just that. It’s going to take some creativity. It may mean changing the way you find the stuff to fill it, but your kids are worth it. and you can feel good about ditching the waste. Are you ready to begin? Let’s jump right in and set out some simple guidelines to help you keep waste to a minimum this Easter. I’m sure these are things you already do, but it is worth reminding ourselves before we buy anything. Our goal is to reduce waste, and do something more sustainable, right? Recycle or upcycle wherever possible. When we buy something, choose eco-friendly products with as little waste as possible. First of we are going to need a basket. What do you have in your house that you could use? Thrift stores are a good source of baskets. Brighten them up with soap and water and add some paint if needed. If you need to buy something, try to find a basket/bag that can be reused year after year. Here are some options. Easter grass is not necessary, but I’ll admit it looks great lining the basket. Here are some waste free options. The play silks come in all colors and can be used as a toy once Easter is finished. Eco Tip: Do you have a shredder? Why not shred up some Easter flyers? The other thing that is fun to do is to grow your own grass. It is great project to do with kids. You can find instructions here. This is where it gets tricky. You can always reuse refillable plastic eggs that you have at home. 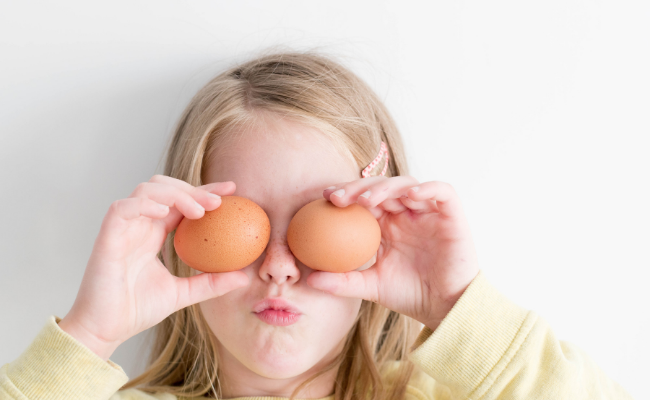 If you are looking for something new try eggs made from plant-based plastic, decorated tin eggs or wooden ones. All of these can be used year after year. Eco tip: Collect used eggshells and grind them up. Put a handful of the shells in when you are planting tomatoes. They love the extra calcium. I discovered very early on that my boys didn’t care what form their chocolate came in. They didn’t get upset at the lack of eggs and were just as happy with their favorite chocolate bar. Most Easter eggs come with loads of packaging and very little chocolate. The everyday chocolate bars taste just as good, have far less waste, and are about a third of the price. You could also try your hand at making sweet treats. Hello Jello and Nutella Cream Eggs! Has your child been given a gift for Christmas they didn’t get around to using? Can it be put in the basket? 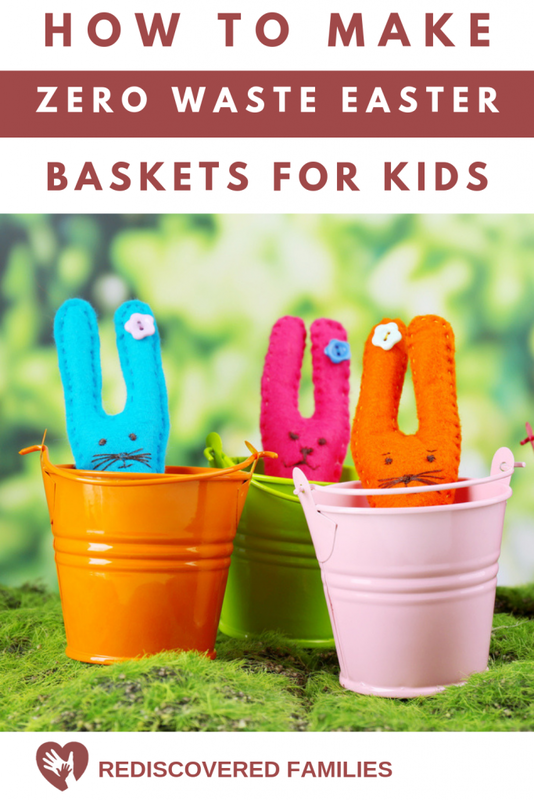 Do your older kids have gently used Easter basket gifts they don’t use? 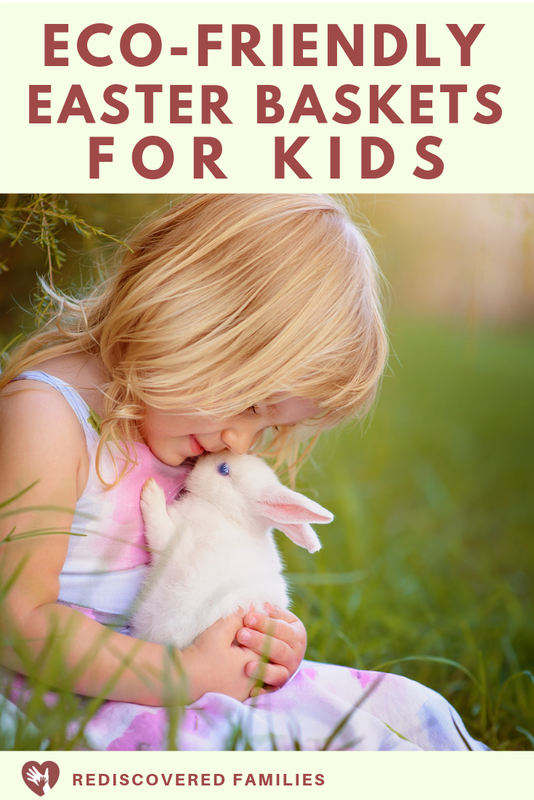 Ask for permission to use them for a younger sibling. Gather random art and craft supplies and use them to make mini art kits. Eco Tip: All of these home made gifts can be stored in mason jars if you want to go truly waste free. Soft toys: My boys could never get enough small soft toys. I have mixed feelings. On the one hand they are very cute, but they aren’t always environmentally friendly. 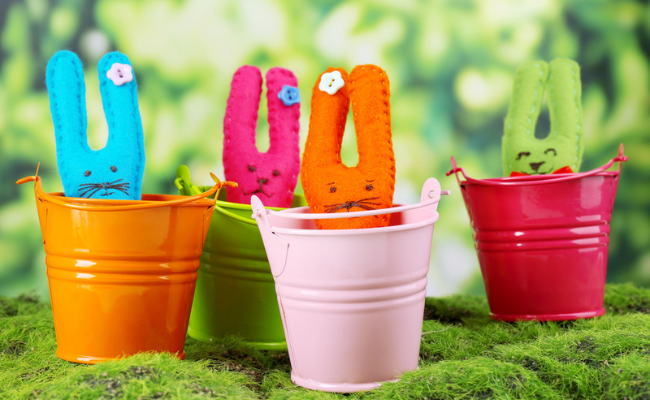 If you have Easter plush toys from previous years, why not re-use them? If not here are some made from organic materials. Creative Toys: Anything that encourages creativity is always welcome and provides the perfect indoor activity for rainy spring days. Here are some eco-friendly ideas. Books: Books will always be on my list. Though I really cut down on the number of toys, books were something we never skimped on. I wanted my boys to have access to plenty of good books. Eco tip: If you want to give the gift of books in a waste free manner, why not gift a library card and a book bag? 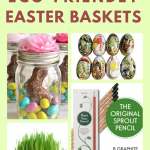 Do you plan to make an eco-friendly Easter basket this year? What kinds of things will you put in it?